1681 Robart the son of Thomas Pitt and Jane born ye 18 day of August baptized the eleventh day of September being born in the town of Ashburton in his mothers travill from Plymouth where she arrived in a shipp from the East Indies. Above: 1806 map published by Laurie and Whittle, London. The roads are measured from Hyde Park Corner. 1754 'Mr Harris of Ashburton reported from the committee to whom the petition of the Gentlemen, Clergy, Freeholders and principal inhabitants residing in and near the Town and Borough of Ashburton, in the county of Devon, was referred...Mr John Dunning, being examined, said that he knows the road from Chudleigh Bridge, in the parish of Hennock, in the county of Devon, through the Borough of Ashburton to Brent Bridge in the Parish of South Brent inthe said county of Devon; and that the same is very rough in several places, very narrow and much out of repair; and that it cannot be sufficiently repaired by the ordinary course of law. Mr Solomon Earle confirmed the above evidence in every particular. Will of Aelfwold, Bishop of Crediton c997-1012, amongst the Crawford Charters in the Bodleian Library. See The Crawford collection of early charters and documents now in the Bodleian Library, ed A S Napier and W H Stevenson, Oxford, 1895, p23. 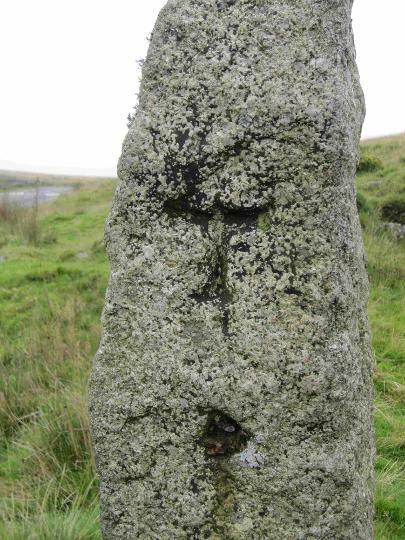 This is believed to be the first written record of ponies on Dartmoor. *It should be said that H J Hanham argues that the Anglo-Saxon phrase does not specifically indicate horses. 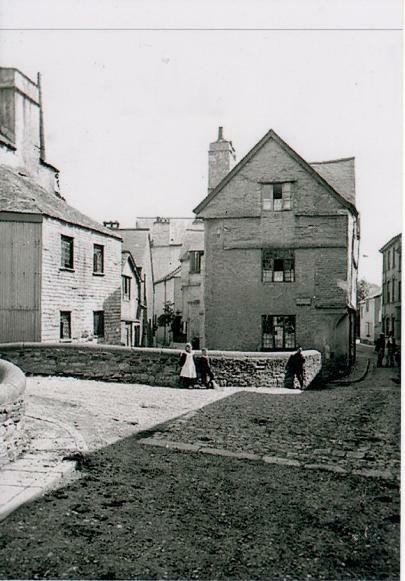 The Book of Ashburton has a photograph of a doorway in North Street which curved outwards at the bottom, to allow the packhorses through without the need to unload them. It belonged to one of the houses demolished in 1971. 'The Dartmoor ponies, which run wild on this vast waste, are very celebrated. Their appearance is unsightly, but then they are sure-footed, hardy, and in every way calculated for traversing the hills of this county. 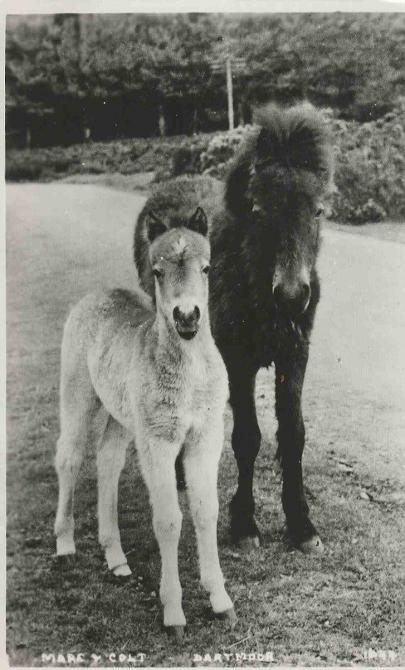 Left: Dartmoor mare and foal, mid 20th century. 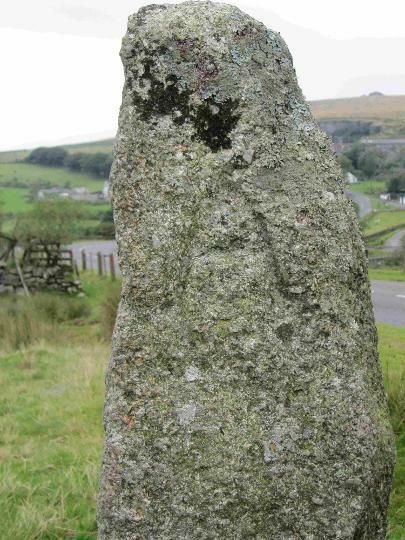 Above: Stones still mark some of the old Tavistock-Ashburton packhorse track, with incised letters indicating the direction of the two towns. This one is beside the road leading from Meriivale Quarry up the hill towards the car-park. As the industrial revolution progressed, fast and reliable roads became essential for trade. The Turnpike Acts, 1663-1836, allowed trusts to be formed on specified stretches of road. These trusts could levy tolls on road-users, the ensuing funds being used to maintain and repair the road in question. A gate, or turnpike, was placed across the road, and this was only opened when the toll was paid. The demand for the formation of trusts reached a peak between 1751 and 1772 - 'Turnpike mania'. 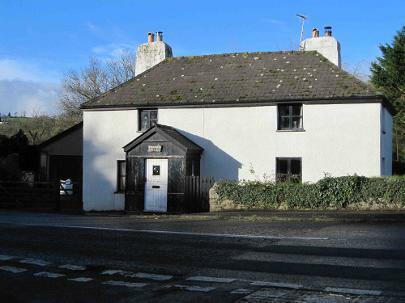 Above: Goodstone Cottage, on the Newton Abbot to Ashburton road (just before the road enters the A38 dual carriageway). It is believed to be an old toll house. The advertisement was put in by Robert Abraham jnr., clerk and treasurer. The book Buckfast in Bygone Days (Hilary Beard, Devon Books, 1991 p 86) has a photograph of the Toll House Dartbridge. It was demolished in the 1970s. Two stage coaches pass through here from Exeter about 12 every day on their way to Plymouth; and there are two from Plymouth, which pass through about one, to Exeter. Fare from Ashburton to London 2l 7s 6d. Russel's stage waggon*, from London, arrives here every Wednesday evening, and sets out next morning for Plymouth - carriage of heavy goods from London, 9s per cwt. The Universal British Directory of Trade, Commerce and Manufacture, vol 2, London, late 1700s. In 1808 an advertisement appeared in the Exeter Flying Post for coaches travelling between Exeter and Plymouth via Chudleigh and Ashburton. T Cousins of the Golden Lion and J Lloyd of the London Inn were two of the operators. The cost was half a guinea inside and seven shillings and sixpence outside. In 1841 the Quicksilver coach was involved in an accident at the entrance to Buckfastleigh. William Taprell, a hair-dresser from Ashburton, was knocked over by the coach and a wheel ran over his body. He sustained extensive bruising and possibly a broken rib, and was said to be 'very ill.' No blame was attached to the driver, owing to the dark and wet conditions of the evening, the narrowness of the road and the position of houses which meant that the coach had to execute a sharp turn. Six years later the Quicksilver Mail was about to leave the road. In 1847 the Western Times reported that it was to be replaced by steam. Many old people, reminisced the article, could remember the Diligence Coach of fifty years ago - if you couldn't afford the premium fare you travelled in a basket fastened behind the vehicle. Other vehicles included the Regulator, the Subscription and Defiance. 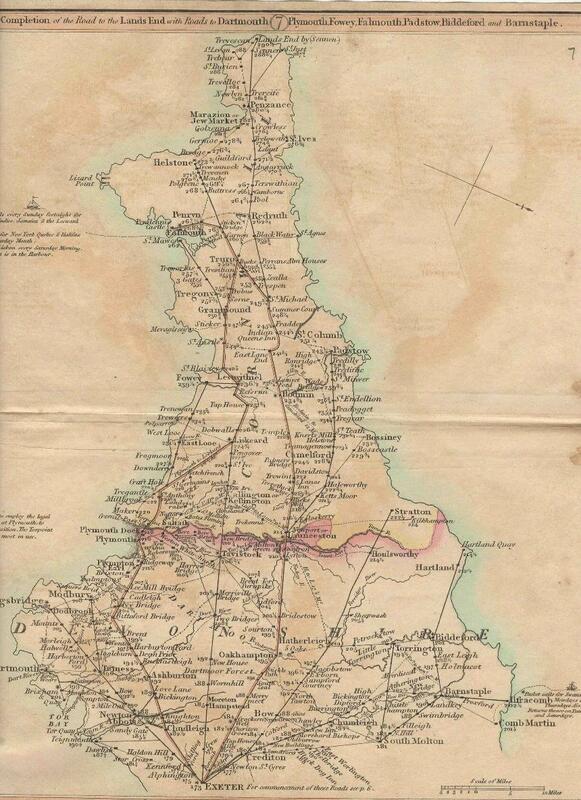 It took at that time 12 hours to travel from Plymouth to Exeter - by 1847 it was down to 5. The next month the Exeter and Plymouth Gazette noted that George Bate of the Golden Inn, had begun a daily coach service to Newton Abbot Railway Station. Five year old Emma Satterly was on the way to the Board School when she was knocked over by Mr Hill's omnibus, driven by William Caunter from the Railway Station. The wheel of the 'bus went over her knee and fractured it. Above: King's Bridge and Kingsbridge Lane, showing a surface of stone setts. In 1907 the Highway Committee wanted paving in various parts of the town to be taken up and replaced with concrete. The proposed areas were St Lawrence Lane and from the Capital and Counties Bank to West End House. New kerbs and tar paving was planned from the top of North Street to Great Bridge, and it was proposed that channeling in Bowden Hill be replaced, and that cobblestones in the pavements be replaced with tar paving. In 1921 the Highway and Lighting Committee of Ashburton Urban District Council recommended that tar macadam be laid instead of the cobblestones on the approach to Hare's Lane. At a meeting of the Urban District Council in 1924 the state of the roads was discussed. 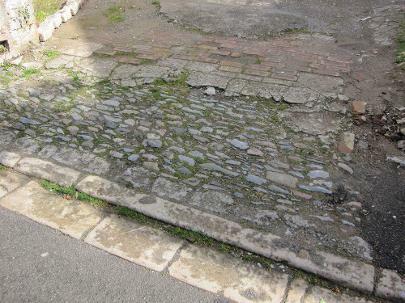 Mr Langler wanted the cobble stones in East Street replaced, but it seemed unlikely that the County Council would provide financial assistance. Mr Langler wanted concrete, because tarred roads were proving slippery for horses, and there had been several accidents. The Council decided to instruct the Surveyor to coat the roads with sand and gravel on a regular basis. 1792 A sketch map of a canal from Totnes to Ashburton via Staverton and Buckfastleigh is held by the South West Heritage Trust. It has a scale of 7.6" to the mile, and limekilns, bridges and the turnpike are marked. In the early 20th century much of the travelling that people did was communal - in horse drawn vehicles, (gradually replaced by petrol driven omnibuses) or on the train. As an individual in a rural area, you may well travel by horse, and from the late Victorian era, by bicycle. Unless you were wealthy, a motor car was out of the question - but as the century wore on, many people found that a motorcycle answered their needs for faster (and more exciting) travel. 1907 About 30 cars belonging to members of the Devon District Automobile Association travelled through Ashburton, having met at the Golden Lion. A large number of people gathered at the Bull Ring to watch the cars go by. 'Though the main London to Plymouth traffic passed through the town, it was not busy. The blue bus took passengers to Newton Abbot, and the train ran frequently to Totnes. 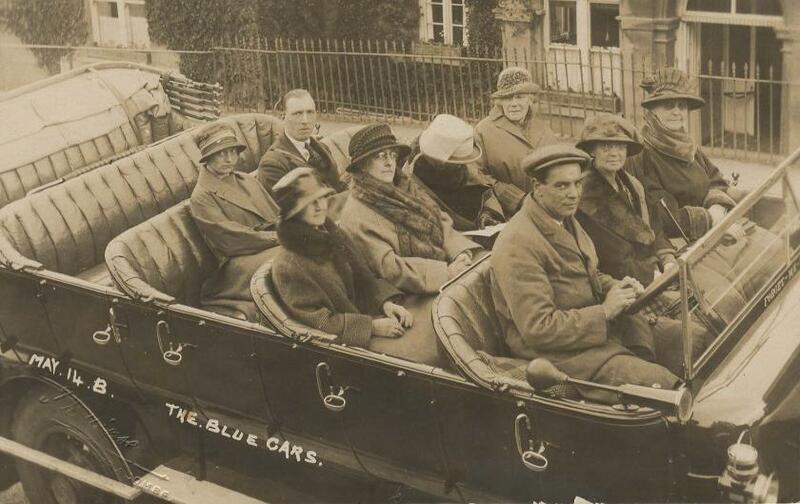 The charabanc took groups of people on outings to favourite venues, and for many this was the annual day out, anticipated and saved for throughout the year. The town became deserted on a Wednesday in July each year when the schools closed for the annual Sunday School treat. Mothers accompanied their children and it was a day of great excitement. The churchgoers went to Teignmouth by train, the chapel supporters to Paignton. Gradually signs of change appeared. Occasionally an aeroplane would be heard, and everybody would gaze up to watch this wonderful invention. People still marvelled at the automobile - the possession of the affluent - but insidiously, motor vehicles were replacing the horse and cart. There was increasing concern for the safety of children, and people realised that there was a need for a main road to by-pass the town. Unemployment was widespread throughout the country and this led to an influx of migrant workers, mainly from Wales where the miners were in a desperate state. Young men with strange accents arrived and found board and lodgings in the town, working long hours in all winds and weathers. The sound of blasting could be heard frequently, a familiar activity to these men who had spent their working lives underground. For me, an abiding memory is associated with the 'navvies' as they were called, on long summer evenings, seen in retrospect to have been hot and sunny - bedtime came much too soon. I read as long as possible, and then willed myself to stay awake until ten o'clock, when time was called at the Railway Inn. The church clock chimed the hour; I would slip out of bed and creep into my parents' bedroom which was at the front of the house. Easing up the sash window, I would sit on the seaman's chest which my father had brought home from his time in the navy, a reminder of the three years he had spent on the 'China Station'. Shortly after the hour had struck I was rewarded for my vigil, the sound of voices could be heard as these young men walked three or four abreast up the street. As a small girl, I was yet to experience the sadness and heartaches that we all encounter at some stage of our lives, but I sensed the pathos and nostalgia in the dignity and solemnity as they walked along. Never had I heard such beautiful singing: I can recall the haunting strains even now. My favourite song was 'All Through the Night', closely followed by 'Land of my Fathers'. Some nights I returned to bed with the militant sound of 'Men of Harlech' ringing in my ears, reminiscent of strife and war long since gone in far off Wales. Some of these young men stayed on after the by-pass was completed. They were a welcome addition to a little town which was insular and in need of fresh blood. At first they were viewed with mistrust, but gradually became accepted in the community: they married local girls and settled down to life in Devon. Their politics led to shocking local people when a couple of them refused to stand for the National Anthem, and one man persisted in not only sitting whilst all around him stood, but actually kept his hat on! Time mellows all of us, and he, like some of his compatriots, became valuable members of the community, serving on the town council and holding other public offices'. 1930 J Fogden organized a petition amongst the traders of Ashburton, protesting against the proposed by-pass. They feared the loss of trade, already threatened by buses taking customers to larger towns and cities, and they argued that the existing road was quite adequate. One of the traders' suggestions was to widen West Street, affecting Haytor House and a neighbouring property, and also some cottages opposite Barnes' Café. Ashburton Motor Works, proprietor E O Babington, had two advertisements in the Western Morning News in October 1920. One was for a trip in the charabanc 'The Dart', which was going to London for a week (fare £3); another was for a daily bus service running between Buckfastleigh, Ashburton and Newton Abbot. Details could be obtained by telephoning Ashburton 15. An undated advertisement for Ashburton Motor Works and Garage, proprietor E O Babington, states that he is the proprietor of the Blue Saloon Motor Bus Service. Above: The Blue Cars, 1924. Unknown location, but the postcard was written (by one of the passengers) from Torquay. Newton Abbot Urban Council were concerned about overcrowded buses in 1924. A reply by the Devon General Omnibus and Touring company admitted that there was overloading due to the large numbers of visitors from July to August, and said that there would be more cars next season. Meanwhile their officials had strict instructions to bring on more vehicles where necessary. Mr Babington said he was aware of the difficulty, but maintained that buses on the Ashburton road were only overcrowded on short stretches, and that there was plenty of room once vehicles were past Mile End and Seale Hayne. He was having another bus built. In February 1925 the body of a man was found in the canal at Newton Abbot, near the goods station of the Great Western Railway. A return bus ticket from Ashburton provided a clue to who he was - he was later identified as Mr Davies of Ashburton, a pensioner of the GWR. According to Leslie Folkard, Devon General Omnibus and Touring Co. Ltd. buses were based in various towns in the county. These included Ashburton: at Dropping Wells between 1925 and 1927, and in West Street (the Blue Saloon Motor Services) between 1927 and 28. These were either in garages or open yards. The website https://sites.google.com/site/companiespastpresent/home says that Devon General purchased land at Dropping Wells in February 1927, planning to build a garage for four vehicles. Later that month the company leased premises in West Street from James Fogden - these were to be used for a parcels office, waiting room and inspector's flat. Devon General appear to have bought a business from Mr Babington, together with a freehold house and garage behind 34/36 West Street. 4 or 5 buses could be accommodated in this garage, which became the company's depot from 25th May. Mr Babington continued to trade from premises in East Street, with a contract for a school run, but had agreed not to run any other bus services. He did, however, act as the parcels agent for Devon General. A green leather handbag was left on the blue bus at Ashburton in March 1927. The finder was asked to hand it in to Babington's office. Also in March, the steering failed on a blue bus driving between Ashburton and Newton Abbot. The front of the bus was badly smashed after it hit a stationary caravan, and both the occupant of the caravan and a passenger from the bus were taken to Ashburton Hospital. Mr Pearson was the driver. 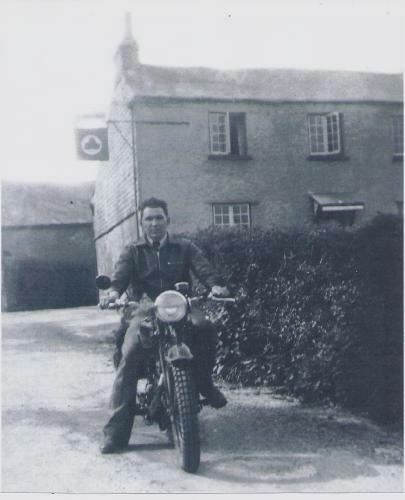 In 1930, George Margrie, a bus conductor from Cape Cottage, Ashburton, was involved in a motor cycle accident. Whilst riding on the Ashburton to Buckfastleigh main road, he and another motor cycle collided, with the machines locking together. The other cyclist, a sailor, was seriously injured and was taken to Ashburton hospital; Margrie's less serious injuries were attended to by the matron from the hospital, at Dr Ellis's surgery. Charles A Gayton and his wife appear on the 1939 register at Dropping Wells. Charles was a motor coach and garage proprietor, in addition to being a marine store dealer. In 1949 Mr C A Gayton, of Dropping Wells, applied for a licence to operate buses between Ashburton and Stover Park for the duration of the Devon County Show. 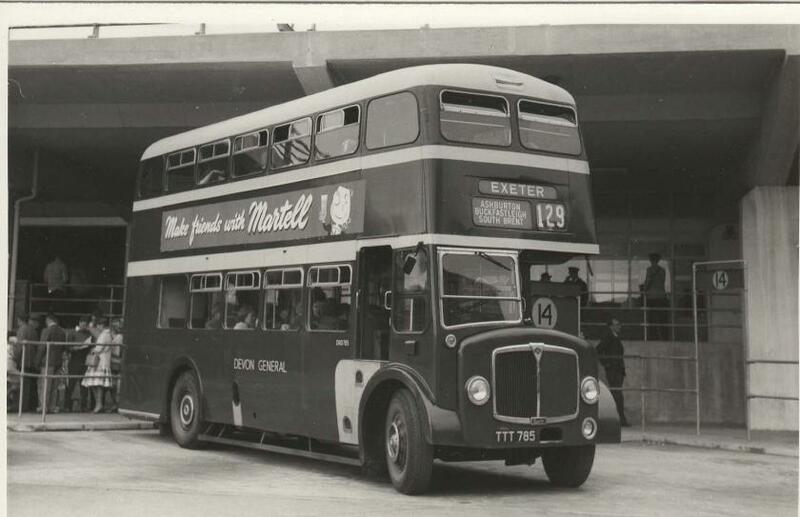 The Devon General Omnibus and Touring Co. Ltd. objected, saying that it was an 'attempt to steal the cream of traffic'. The application was dismissed. Above: Coach at New Bridge. Date and company unknown. 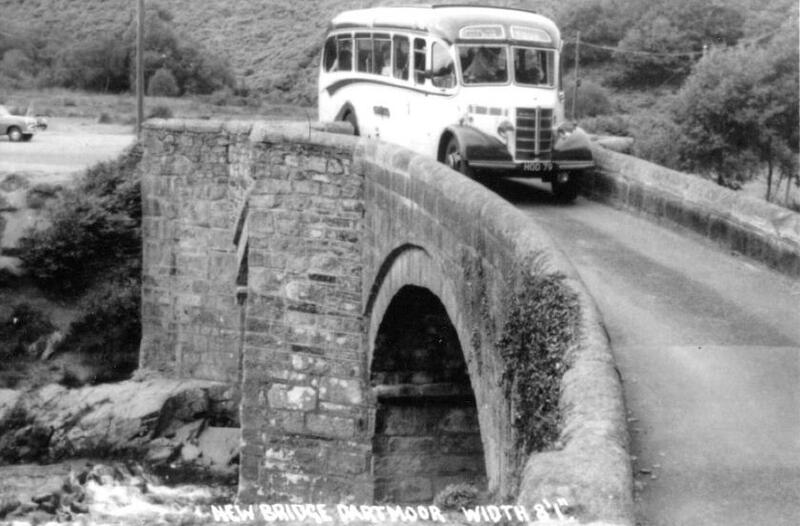 Above: Devon General Bus, travelling between Exeter, Ashburton, Buckfastleigh and South Brent. 1950s? 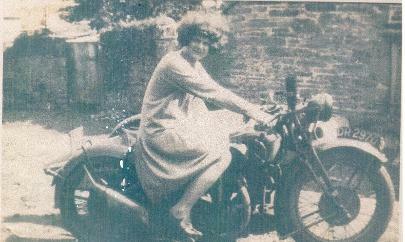 Above: Ellen Bligh on a motorcycle, 1930s. There is some debate on the make - I originally thought it was a Brough, but it has been suggested to me that this may not be correct. Left: Russell Martin outside the Rising Sun Inn, Woodland. Left: A hire purchase agreement for Mr R H Martin, of the London Hotel, 11 November 1948. 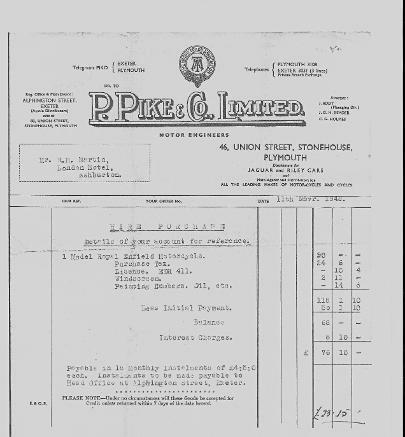 He was buying a Royal Enfield motorcycle from P Pike and Co. Ltd., 46, Union Street, Plymouth, for £90. He paid an initial deposit of £50 1s 10d, and the arrangement was for him to pay 18 monthly instalments of £4 5s each - the interest would come to £8 10s. The basic hire purchase act was passed in 1938, but this was to regularize a system that had existed in the US and UK from the 1800s. According to Subhamoy Das, hire purchase really began in the UK with the hiring out of railway wagons to railway companies, collieries and quarries in the mid 1800s.